Save the date for the 2019 Women of Distinction Luncheon on Tuesday, September 24, 2019! 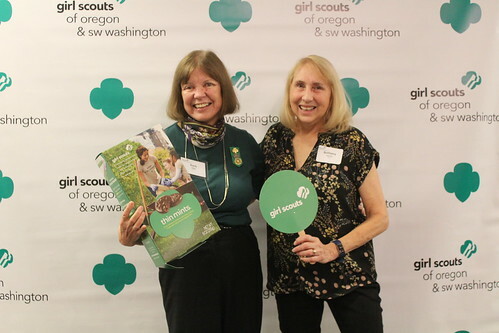 Submit your nominations for consideration by April 1, 2019 or contact Shannon Spencer at (503) 977-6843 or sspencer@girlscoutsosw.org for sponsorship opportunities! Check out our flickr album of the 2017 attendees having fun at the Luncheon's photo booth and enjoying the Luncheon! In 2018, 550 Girl Scout alumni, friends and community supporters gathered for the luncheon, and together you directly invested over $130,000 for the success of girls in your community. Thank you! The Marie Lamfrom Women of Distinction Luncheon recognizes outstanding women leaders for their contributions to the community. Honorees exemplify the Girl Scout mission as women of courage, confidence, and character, who make the world a better place. Luncheon proceeds allow GSOSW to provide the Girl Scout Leadership Experience (GSLE), enhance our four priority program areas: Financial Literacy, Healthy Living, STEM (Science, Technology, Engineering, and Math), and Outdoor Leadership, and support various Girl Scout activities and programs for nearly 15,000 girls throughout Oregon and SW Washington. Marie Lamfrom served in World War I as a nurse, working on the Russian front at the age of 18. At the end of the war, she returned home to Germany and married Paul, then had three daughters. As the Nazis rose to power, Marie and her family fled to Portland, Oregon. They purchased a small hat company, which later grew to become Columbia Sportswear. Marie Lamfrom from Jay McKenney on Vimeo.